Announcement Orders are SHIPPED within 24 Hours! We offer expedited and/or international shipping at an additional cost. Please contact us for more details. Orders are SHIPPED within 24 Hours! We offer expedited and/or international shipping at an additional cost. Please contact us for more details. We Love Wreaths is made of a cute Mother (Tina) and Daughter (Me - Chrystal) Team. Created out of love for decorating for the holidays, sparked a business of sharing the same enthusiasm. We collaborate on new ideas, textures and styles. Working together introduces very new dynamic as we balanced our relationship as business partners and family. I (Chrystal) generally handle all the “business” stuff. Social media and marketing isn’t my mom’s forte. My mom is the creative force who sees their designs through to execution, which is second to none. Check our feature on AARP. 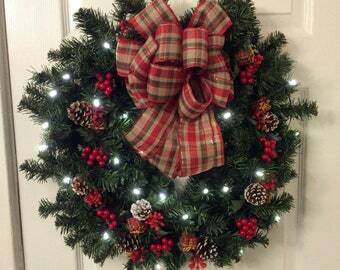 We specialize in Christmas Wreaths, Holiday Wreaths, Summer Wreaths, Door Wreaths and Winter Wreaths. Chrystal here! A lil about me…Fun-loving active adult that still enjoys Christmas with child-like wonder, amateur shutterbug, and an avid Jeopardy watcher. A bit internet shy, retired and on the Go. Thankful for these “Blessed Hands” that allow me to be extremely creative and actually love what I do. Welcome to We Love Wreaths. Our wreath designs include anything from traditional to the whimsical. Wreaths make a unique house warming gift, adds personal touch to any living space and creates a warm inviting atmosphere. We specialize in Wreaths for the holidays, Christmas Wreaths, Christmas Wreath Ideas, Gold Wreaths, Burlap Wreaths, Battery operated wreaths, pre-lit wreaths, thanksgiving wreaths, wreaths, large wreaths, fall wreaths, unqiue wreath, deco mesh wreaths, mesh wreaths, winter wreath for door, gifts for teachers, baby shower decorations, topiary, door wreath, custom wreath.